System prototyping performs the analysis, design, and implementation phases concurrently in order to quickly develop a simplified version of the proposed system and give it to the users for evaluation and feedback. (See Figure 2-6). The system prototype is a “quick and dirty” version of the system and provides minimal features. Following reaction and comments from the users, the developers reanalyze, redesign, and reimplement a second prototype that corrects deficiencies and adds more features. This cycle continues until the analysts, users, and sponsor agree that the prototype provides enough functionality to be installed and used in the organization. System prototyping very quickly provides a system for users to evaluate and reassures users that progress is being made. The approach is very useful when users have difficulty expressing requirements for the system. Throwaway prototyping includes the development of prototypes, but uses the prototypes primarily to explore design alternatives rather than as the actual new system (as in system prototyping). 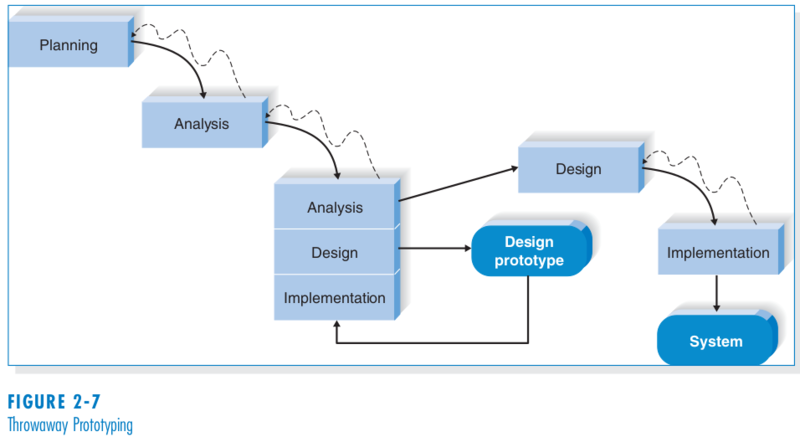 As shown in Figure 2-7, throwaway prototyping has a fairly thorough analysis phase that is used to gather requirements and to develop ideas for the system concept. Many of the features suggested by the users may not be well understood, however, and there may be challenging technical issues to be solved. Each of these issues is examined by analyzing, designing, and building a design prototype. A design prototype is not intended to be a working system. It contains only enough detail to enable users to understand the issues under consideration. For example, suppose that users are not completely clear on how an order entry system should work. The analyst team might build a series of HTML pages to be viewed on a Web browser to help the users visualize such a system. In this case, a series of mock-up screens appear to be a system, but they really do nothing. Or, suppose that the project team needs to develop a sophisticated graphics program in Java. The team could write a portion of the program with artificial data to ensure that they could create a full-blown program successfully. A system that is developed by this type of methodology probably requires several design prototypes during the analysis and design phases. Each of the prototypes is used to minimize the risk associated with the system by confirming that important issues are understood before the real system is built. Once the issues are resolved, the project moves into design and implementation. At this point, the design prototypes are thrown away, which is an important difference between this approach and system prototyping, in which the prototypes evolve into the final system.